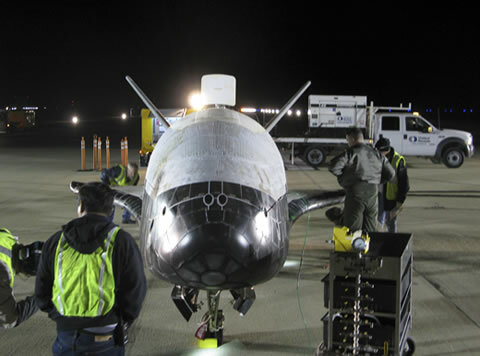 The X-37B is shown here after completing its first experimental test mission. The US Air Force has announced that the secretive X-37B spaceplane is being prepared for a second launch on 4 March 2011. The tiny craft is a remarkable machine, small enough to fit inside the Space Shuttle’s cargo area, and capable of remaining in orbit for months at a time while moving from orbit to orbit to hide from prying eyes. It is also completely unmanned. It has already completed one succesful test mission, in which it demonstrated its unusual maneuverability repeatedly – amateur satellite watchers frequently lost track of it as it shifted its orbit, although they always managed to find it again after a short while. Like the first mission, it will be launched on top of an Atlas rocket built by United Launch Alliance. As before, no details of the mission have been released.